When a little girl finds an adorable robot in the woods, she presses a button and accidentally activates him for the first time. Now, she finally has a friend. But the big, bad robots are coming to collect the little guy for nefarious purposes, and it's all up to a five-year-old armed only with a wrench and a fierce loyalty to her mechanical friend to save the day! 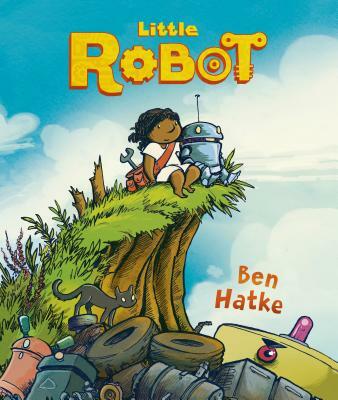 In the Eisner-winning graphic novel, Little Robot, New York Times Bestselling author Ben Hatke brings his signature sweetness to a simple, moving story about friendship and overcoming fears that will appeal to readers of all ages. Ben Hatke is the author and illustrator of the New York Times–bestselling Zita the Spacegirl trilogy, the picture books Julia's House for Lost Creatures and Nobody Likes a Goblin, and the graphic novels Little Robot and Mighty Jack. He lives and works in the Shenandoah Valley with his wife and their boisterous pack of daughters.